The primary webpage of CarLibrary.org digital archive project, promotes the use of the open-source Greenstone Digital Library program for car historians, collectors, museums and collections, to encourage the creation of digital archives. This webpage describes using Picasa and other Windows programs to improve the identification - and eventual classification - of digital photos and scanned documents and photos. This is not only highly useful for Greenstone, but for many other programs which classify and display digital assets. This guide was started in December 2012 through trials and tests of Picasa, Greenstone and other Windows utility programs. The trials are on the "Trials and Tests with Picasa, Metadata, Greenstone and the ExifTool" page in chronological order. Preliminary recommendations are also near the end of this webpage. In my experience, these recommended steps will minimize the re-entry of data and reduce the duplication of processing steps. As more is learned, these recommendations will be refined. Even in personal collections, there are always many digital photographs and image documents to identify for future use. If captions (or similar identifying data) can be readily added in a (standard) photo organizing program, there is a better chance the identification process will be "actually done" rather than delayed or never done! Although identification can be done by adding "metadata" to each image in the Greenstone digital library program - and "externally" to the photo/image files with programs such as Excel - this extra step rarely results in data with long-term links to the image/photo. This important archive issue is discussed on a Library of Congress blog: "Mission Possible: An Easy Way to Add Descriptions to Digital Photos." "Metadata" has been around for a very long time, but this term only appeared in 1968.. One example of "metadata" is the information on the cards in a library card catalog, where book titles, author, summary, etc can be found for the books of a library collection. A common definition of metadata is "data about data" or more fully, "'content about individual instances of data content' or metacontent, the type of data usually found in library catalogues." Wikipedia provides a great explanation and history of metadata. In the digital world, library card catalogs are now on databases and search terms are used to search for the metadata - to locate the desired books! Digital files nearly always contain their own metadata. For example, Microsoft Word and Excel files contain file creation date and frequently list the "author", which can be seen in "File Properties". Music MP3 files contain much metadata, such as song title, length, artist, etc. Images/photos from digital cameras contain a great amount of metadata, including photo date, camera model, shutter speed, etc. As more detailed in the Wikipedia reference above, photo metadata appears in specific standard categories, as will be seen in examples below. Although not a common term, "external metadata" is the type found in a card catalog or on a list of books or photos. The type of metadata in an Excel file or digital photo is "embedded metadata". 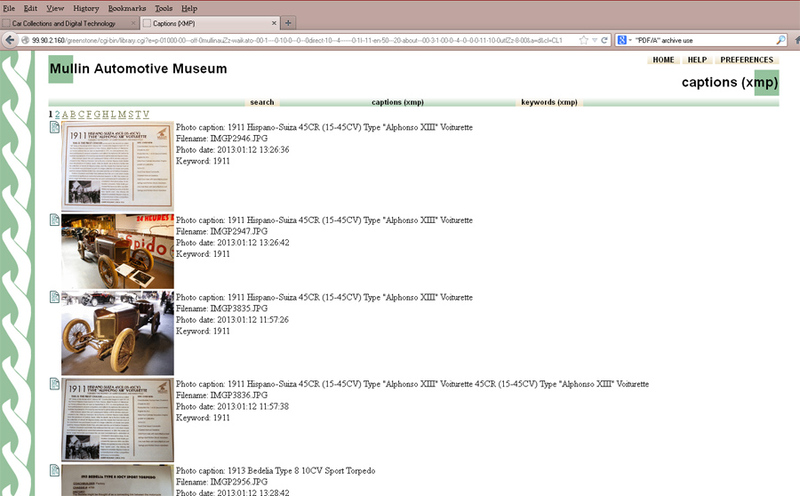 Even the Smithsonian Institution recognizes the benefits of embedded metadata. A. This is the equivalent of "writing on the back of a photo" and important identifying information will be with the image or document long into the future. B. This metadata can be used by many other programs to classify or locate a specific digital file based on single items of the embedded metadata. For example, if one or more photos are captioned with "1963 Chicago picnic with Grandma Smith", searching on "1963", or "picnic" or "Grandma Smith" will find those photos. C. Using embedded metadata can significantly reduce data input and make descriptions more consistent. Rather than enter "1963 Chicago picnic with Grandma Smith" more than once in a database or spreadsheet to describe a photo, it can be extracted from the photo's metadata to produce a spreadsheet list. Less data input usually means less errors! D. Metadata added by offline/offsite individuals (or by volunteers) working on a subset of the digital files can be a "gateway activity" to forming a digital archive. I've personally been using the (free) Picasa program from Google for several years to make minor edits to digital photos, such as cropping and light correction. I also use Picasa to organize, by year and month of creation, my (thousands of) digital photographs, many images scanned from slides and negatives and images of scanned documents. Picasa provides a function to make "albums" with subsets of these photos without changing the original directory (location) of the images. Sorry to say, only a fraction of my photos have captions, even though this step is not difficult in Picasa. However, after learning that Picasa captions can be extracted to Excel files to make lists or used by a digital library/archive program (Greenstone and others), there is now a great incentive to caption everything! There are other programs that will caption - or otherwise create more types of metadata in digital photos - so Picasa need not be the "one size that fits all". For example, the ExifToolGUI, discussed in section 3. below, also provides an easy method to embed metadata after setting up its Workspace manager. Metadata written by ExifToolGUI in the correct categories described below will appear as captions and keywords in Picasa! If you use another program, let me know and I'll add your experiences to this guide. A. If you don't have Picasa, download it from Google and install it the same as any Windows program. B. Picasa will likely try to find all the digital images on your computer. You can control this by using the "Tools" and "Folder Manger" menu options to select or de-select specific folders to add to Picasa. For trial and learning purposes, you only need 10-25 digital images in Picasa. There's no harm to let Picasa "scan everything" except the computer may be busy for a while. D. Photos can be geo-tagged, using the "red pin" (on the lower right of the Picasa screen) Geo-tags are embedded as "EXIF GPSLatitude", "EXIF GPSLongitude", etc. in decimal format. F. The photo date is embedded as "EXIF DateTimeOriginal". G. You can be creative with captions although using "tags" with captions provides more flexibility. If you also put a unique ID (an "accession number" which is a museum "best practices" technique) in the Picasa caption field, a text search on the number would locate the photo. That same number can be written on the original photograph or slide before scanning. The digital representation can be readily cross-referenced and located through the Picasa search function or in many collections management programs. Picasa has other features that are very useful for archive purposes. None of the image edits (except the caption, tags and geotagging) actually change the original photo until it is "saved" or "exported" to a different folder. Until then, the image edits are stored in a small, separate Picasa file. If you have made image edits in Picasa, it is easy to export a folder or group of photos to a folder intended for adding to or archiving in follow-on program in either the original photo size or your choice of a smaller photo size. At this stage, photos (or other digital assets) that have been captioned or tagged in Picasa - or other program - are ready for many future uses, especially ready identification by others at some future time. One important use of digital assets is the creation or a digital library or archive, for personal use, business use or as part of a museum collection. Section 4 below describes how to use/import captioned and tagged photos into the open-source Greenstone digital library software. Two other free programs are potentially very useful to further add identification data to digital photos: "ReNamer" and "ExifTool". ReNamer can change the file name for an entire folder of photos in many ways, including adding metadata. For this sample group of photos, the caption was temporarily added to the file name as a prefix or suffix by selecting "ITPC Caption" choice. If the only the "accession number" was put in the Picasa caption, this data could be easily added to a group of photos. Phil Harvey's ExifTool has the ability to extract, add, copy or move nearly all types of metadata. The basic program must run from a command line, but with the correct configuration, it is very powerful and promises to "do everything" A download and very complete explanation of its functions are here. Using the command line functions are described on the webpage referenced below. Bogdan Hrastnik has written a GUI (Graphical User Interface, Windows only) for ExifTool, which allows very easy access to many of the ExifTool functions. The "how to" and download page for ExifToolGUI is here. For a guide to using both ExifTool and the ExifToolGUI, go to this webpage: ExifTool - Reading and Writing Embedded Metadata which is a section of this CarLibrary.org website. Other sections of this website - and many Internet guides - offer good instructions on downloading and installing Greenstone. A. After the program is installed, the sample/trial captioned and tagged images can be dragged ("gathered") into Greenstone (version 2.85 for Windows is used for the following examples). E. This metadata category can be renamed in the Format panel as "Caption" for the search results display. 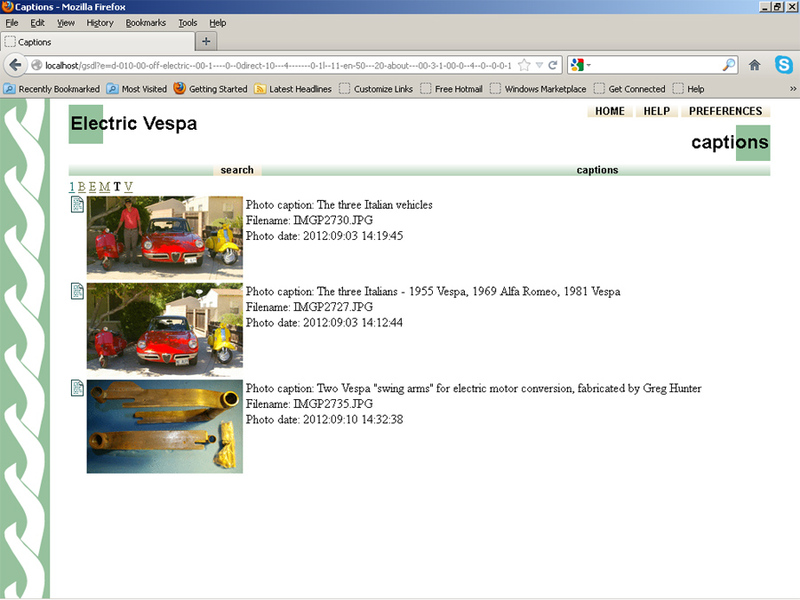 Greenstone shows the correct Picasa caption with each digital photograph. H. Picasa Captions and Tags - If you have added Picasa Tags (keywords), figure 2, below, shows results from browsing in the keywords category, specifically to display the photo ID numbers, as embedded as Picasa "tags." A Greenstone test archive of 190 personal photos taken at the Mullin Automotive Museum was made using only embedded metadata added in Picasa. The metadata includes location data for each photo: latitude and longitude. The newest Greenstone, version 3.0, can use this data for map displays. Note: the Greenstone lab team at the University of Waikato helped fix a bug that was preventing all images from being added to the collection. It was a simple fix - select "unicode" as an option of "input_encoding" in the plugin for embedded metadata. Another bug prevented viewing the embedded metadata in the "Enrich" panel for files with the uppercase "JPG" extension. This was fixed by a simple edit to the "util.pm" file in the "perllib" directory. Contact me for the bug fix sent by the Greenstone Users Group. a. Use Picasa or the ExifToolGUI to put captions on each photo. Captions will be very useful for later identifying the photo. c. If you decide to add a unique ID number to each photo in Picasa, make this the first tag. Best museum/archive practice is to make this unique number an "accession number". If you use the ExifToolGUI to add an accession number, put it in the DC:Identifier category. d. Use the Picasa geo-tag function (red pin), or a similar function in the ExifToolGUI, to locate each photo or group of photos on Google's maps. e. "Export" the photos from Picasa for use in Greenstone or other archive software at a resolution suitable for the archive's use. c. If long-term preservation is a concern, scan to TIFF or PDF/A format (Note: "PDF/A" is a new standard for long-term archive storage and use of digital images and documents). d. Use the ExifTool, the ExifToolGUI or Picasa, as for digital photos above, to add captions, tags, geo-tags to each image. e. Export the images, as above, from Picasa. TIFF images will be exported to JPG format and image metadata will be preserved. 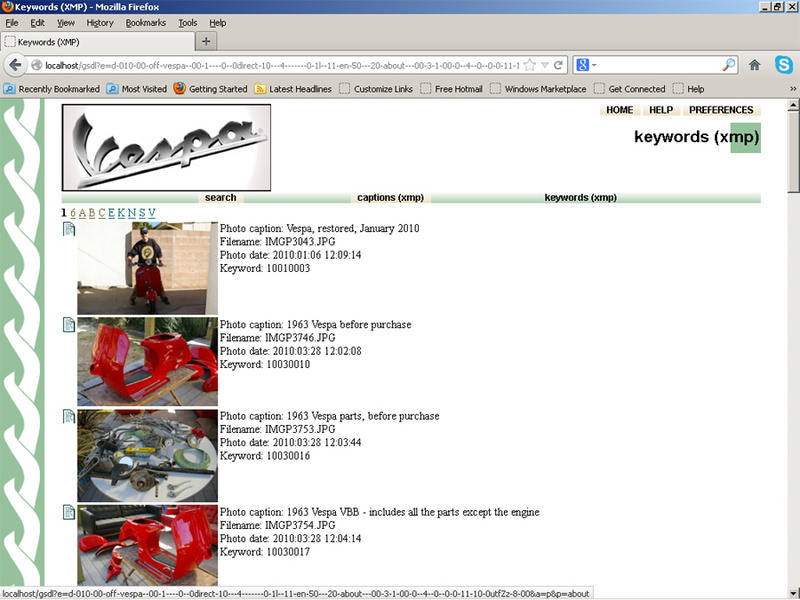 f. However, Picasa does not recognize PDF/A formatted images. Subject, keyword and other identifying data can be added in the ExifToolGUI or a PDF editor, such as Adobe Acrobat, ABBYY FineReader, or Lightning PDF Editor. c. Process each document with good optical character recognition (OCR) software such as Adobe Acrobat, ABBYY FineReader or other tested and proven OCR software. My technical knowledge of Greenstone is "moderate", so improvements to these processes will be by trial and error. I have queried the Greenstone user group (technical support) seeking a more efficient and clearer method to reach these results. At the very least, these tests seem to be on the right track - Picasa is a viable recommendation to initially organize and identify images, especially by reviewers and classifiers with average computer skills. Also, FineReader, the ExifTool and ExifToolGUI promise to be a powerful combination to improve embedded metadata of digital images; I will use these tools for my collections. Note: The Greenstone collections of CarLibrary.org are hosted on a ThinkPad T61 system located in Burbank, using (free!) Linux Ubuntu server software and (also free!) Greenstone 2.85 (Linux) on a 60 GB SSD (OCZ) disk drive.